TOKYO (TR) – Well, it wasn’t the work of Banksy. Tokyo Metropolitan Police have arrested arrested a 27-year-old man who is suspected of spraying graffiti in 15 locations in Minato Ward, reports TBS News (Jan. 18). 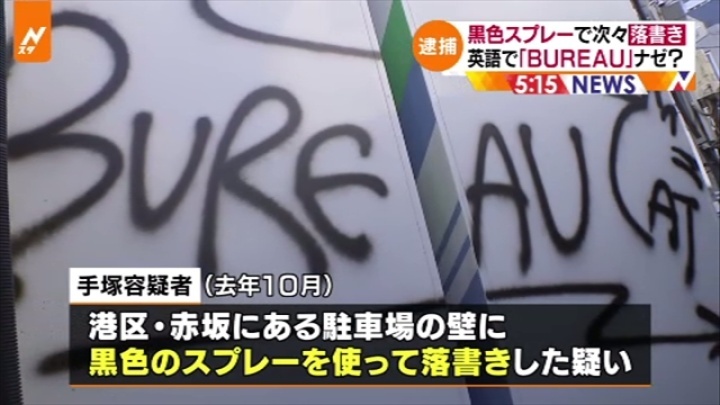 In October of last year, Sora Tezuka allegedly sprayed the text “Bureau Cat” in black paint on a wall at a parking lot in the Aksaaka area. Tezuka, who has been accused of causing property damage, denies the allegations. “I do not clearly recall [the matter],” the suspect was quoted by police. Police have found that same text in 14 other locations, including on a vending machine about one kilometer away from the Akasaka parking lot. Earlier this week, the Tokyo Metropolitan Government speculated that a sketch found on a shutter near Hinode Station in Minato was the work of elusive artist Banksy. The drawing shows a rat holding an umbrella.